Former minister of agriculture and now president of the African Development Bank (AfDB), has become the first African to win the $1m Sunhak Peace Prize. Akinwumi Adesina clinched the prize alongside Waris Dirie, a 53-year-old world-class supermodel and anti-FGM activist, from Somali. The Sunhak Peace Prize was established based upon the vision of One Family Under God. The 2019 Sunhak Peace Prize gives special attention to peace and human development in Africa and also honors individuals and organizations who have made significant contributions to the peace and the welfare of the future generations. The Sunhak Peace Prize includes a cash prize totaling $1 million . The Sunhak Peace Prize committee acknowledged Adesina’s achievements in promoting good governance, which boosts Africa’s capacity to feed itself and transform its total economies for generating wealth for millions of rural and poor African farmers. 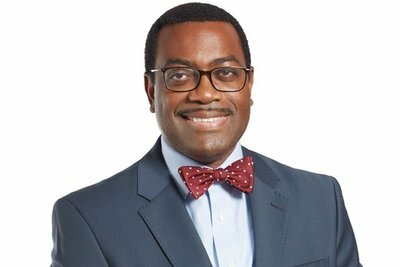 Akinwumi Adesina has been a leader in agricultural innovation in Africa for over 30 years, bringing great improvement to Africa’s food security, contributing to Africa’s dynamic growth. He pioneered major transformations in the agricultural field, including expanding rice production by introducing high yielding technologies, designing and implementing policies to support farmers’ access to technologies at scale. This increased the availability of credit for millions of smallholder farmers, attracting private investments for the agricultural sector, rooting out the corrupt elements in the fertilizer industry, and assisting in establishment of major agricultural policies for Africa’s green revolution. The “Africa Fertilizer Summit,” which he organized in 2006, was one of the largest high-level meetings in Africa’s history that had a focus on solving Africa’s food issues. During this summit, Akinwumi Adesina was instrumental in developing the Abuja Declaration on Fertilizer for the African Green Revolution, whereby the participants stated their commitment to the eradication of hunger in Africa, by 2030. Adesina worked with various banks and international NGOs in order to create an innovative financing system, providing loans to small farmers, providing a way for them to rise out of poverty. This move leveraged $100 million in loans and provided opportunities for small farmers to increase their agricultural productivity, and their income. As an “economic commander” of Africa, he promotes the “High 5 Strategy”, which includes: light up and power Africa, feed Africa, industrialize Africa, integrate Africa and improve the quality of life for the people of Africa. As a result of his work, the lives of millions of people throughout Africa have been improved. The 2019 Sunhak Peace Prize Award Ceremony will take place in February, 2019 in Seoul, Korea.